movie source: PBS's NOVA Science - "Time Dilation Experiment, October 1971"
Observed Facts: Flying eastward and then westward from the stationary U.S. Naval Observatory, General Relativity Physics predicted a time loss of 40 ± 23 nonoseconds on the eastward bound and a time gain of 275 ± 21 nanoseconds for the westward trip; the actual eastward loss was 59 ± 10 nanoseconds going eastward but gained 273 ± 7 nanoseconds for the westward trip!! Rhetorical Question: Is the October 1971 Joe Hafele and Richard Keating clock experiment showing the effects of Special Relativity Physics or General Relativity Physics? Is the British Airways flight around the earth a straight - line, inertial flight subject to Special Relativity Physics analysis or is it rather a matter for General Relativity Physics analysis? The Twin Clock Paradox is only inexplicable for the situation where the actual relativity physics mathematics are not fully understood. The Problem: If a rocket leaves relatively stationary earth and travels a sufficiently great distance with a velocity at a significant fraction of the speed of light, and then later returns ostensibly "younger" than what was left behind, the question therefore arises if all motion is indeed relative, why then could not the earth be considered as having left the rocket and therefore upon the mutual return of earth to the rocket be shown equivalently also as "younger"? 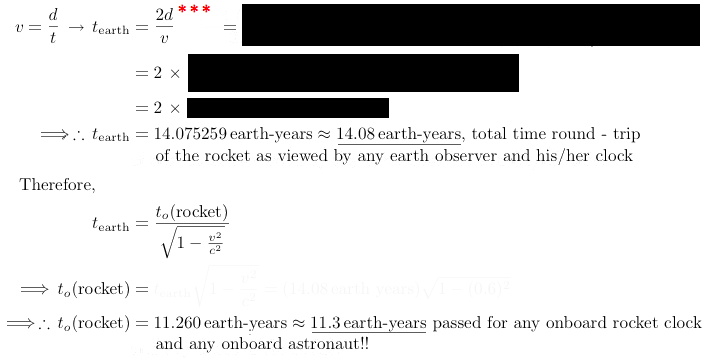 For inertial ( non - accelerating ) straight - line motion, both the rocket observer and the earth observer will see the other as being "younger" since their own respective clock will go faster than the observed passing clock of the other. This is a situation of pure inertial ( non - accelerating ) frames of reference passing each other and hence is not what's being questioned in the "Twin Clock Paradox" since the rocket does not accelerate as they each pass the other unaccelerated. As in length contraction for inertial ( non - accelerating ) straight - line motion, this type of time dilation is mutually reciprocal and therefore needs only special relativity physics mathematics for an explanation. 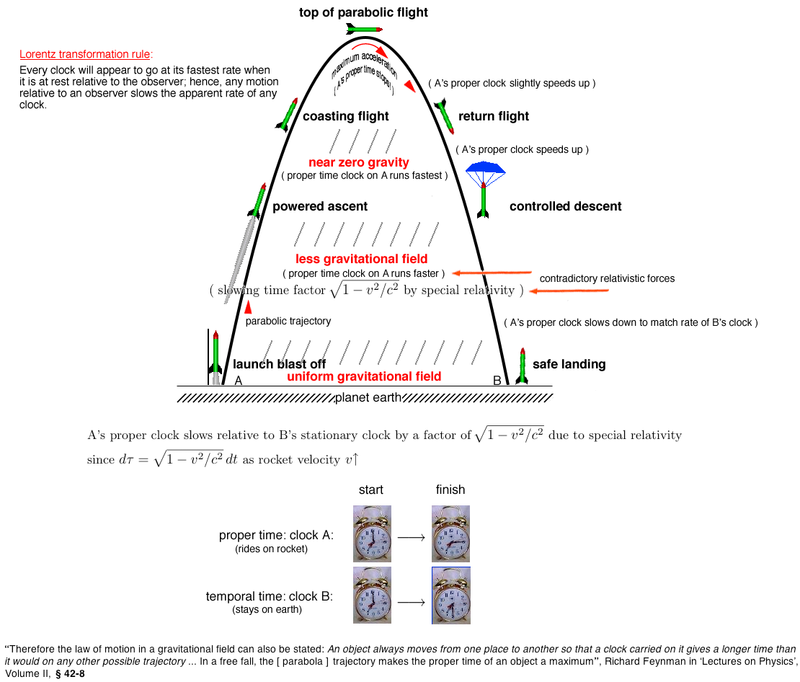 In this second case, gravity force fields must be considered whenever acceleration is occurring such as the rocket in the Twin Clock Paradox turning around and returning back to earth. In this case, where two clocks are running in different gravitational potential fields due to acceleration, it is natural to consider that not only clocks will run at differing rates of time but also that all biologic organisms, including human heart rates and metabolisms, will equally experience differing rates of ageing. in the conventional mathematics of special relativity physics. And when the above Riemannian metric for General Relativity Physics is used for an accelerating, non - inertial spacetme system of bodies in relative motion, the Twin Clock Paradox is resolved and time dilation thus becomes mutually reciprocal as between the stationary observer versus the other moving person! Notice: this generalized Riemannian equation uses only average mean square velocities and does not utilize either the strengths or durations of any bursts of acceleration ! 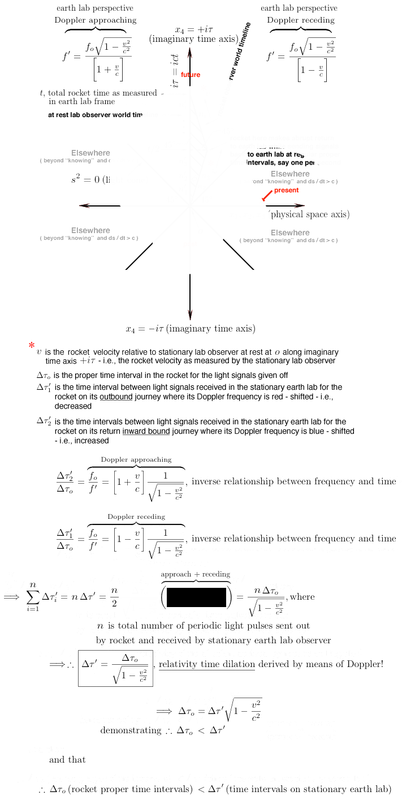 However, we can still analyze the Twin Clock Paradox using Doppler frequencies that communicate between non - accelerated, relatively stationary earth, and our accelerated rocket as the following explanation provides with the added benefit of deriving the time dilation equation of special relativity physics using Minkowski's spacetime geometry! One admission that must be stated is that earlier Doppler was itself derived from time dilation and, therefore, there is somewhat of a tautology ( circular reasoning; redundancy ) being expressed here. However, Doppler can and should be derived separately by means of the original Lorentz Transformation Equations which David Bohm's "The Special Theory of Relativity" accomplishes and to which in some later recapitulation of Relativity Physics and Science Calculator this author will submit a simplified version of this derivation. In the meantime, everything shown here is both mathematically and experimentally true and valid. ∗∗ caveat lector! reader, please beware of these unsettled observations and numbers. note: this calculation assumes inertial ( non - gravitational, non - accelerating ) roundtrip motion which on its face is not possible since any "return motion" is gravitational; unless, of course, you wish to consider a sort of "slow motion turns" as an infinite series of inertial ( non - accelerating ) turns for the return trip.